Is it really November?? Where has the year gone? Are you asking yourself the same thing? Was Halloween really just last weekend? It didn't feel like it where I am considering we only had 1 trick or treater come to our door. Did I miss a few months along the way or was I by chance placed in a time warp in some far away planet and have just now been dropped back here on earth? As my daughter is passing by and reads over my shoulder, she confirms it...’Yes Mother it is November and October is ‘Oct-OVER’...;) [She gets her humor from me, oops she saw that one too and resonates with ‘Yeah RIGHT Mom!’] Well maybe some of it comes from her Dad as well. Anyway it remains a mystery to me how time slips away SOOO fast and the move we just recently went through at the end of September has affected that drastically. My routine was interrupted, my surroundings changed and finding my new normal has not been an easy task. The tugs to unpack, setup for a temporary time until we find our new place vs. the desire and drive to get back to beading and Bead At Home have been at odds. Lots of adjustments. It creates adaptability in us and if we don’t go with it we will feel like we are swimming up stream. Well regardless, even though we must realize that we are faced with the end of the year there is still time left to enjoy 2015. So how will we use these last 2 months of the year? What will we accomplish? What new things will we learn? I'm looking forward to finding out but I don't want to wish my time away dreaming of it, I've already lost so much time already. No matter the season Jewelry is ALWAYS in season. So what jewelry season are you in right now? Just putting away your Halloween jewelry with jack-o-lanterns and fishing out your November Thanksgiving Fall jewelry? Pumpkins perhaps or maybe fall leaves are your motif? 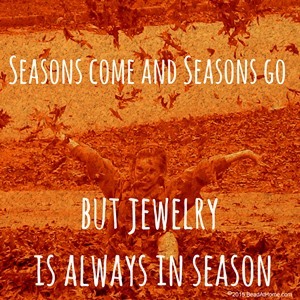 That would be seasonal for sure but what about the jewelry that is always in season no matter what the season outdoors. I find that the colors of the seasons can translate to any season and most beads can as well. A Swarovski crystal is one of those stones that is a classic for any time of the year. With just a little change of the color any jewelry made from these gorgeous stones easily becomes a year round accessory to your wardrobe. Here is a great piece I came across and had to feature it this month for you. It jumped out at me and screamed 'colors of the season'. With my friend's permission, here is a beautiful piece she allowed me to photograph and share with you. You might want to consider adding this to your fall collection, either 'personal' or 'to do'. 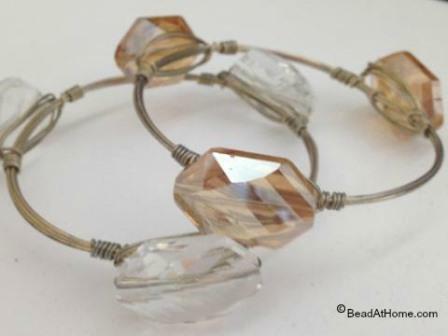 This lovely wire wrapped bangle bracelet incorporates these huge Swarovski crystal stones as focal points. Using 3 stones gives a nice balance to the bracelet. Don't you think? Have you considered attempting wire wrapping yet? It will take practice like everything else, but with results like this it may be worth the investment to learn more about it. This side view hopefully gives you an idea of how the stone has been attached. I am unable to give you exact details since this is not my own creation so this is merely a commentary of what my eyes see. You can see multiple wraps around the stone and at least one pass through the center of the stone, if not two passes. The number of passes will depend on the size of the bead hole and the thickness of the wire. I'm going to guess the wire gauge used was approximately 20 or 22 gauge. As you look at the back view, you can see better, two full wraps around the entire crystal and smaller wraps of wire on either side of the stone, securing it to eliminate the stone from shifting. My guess would be the bangle was created first and then the artist went back and attached the crystals with a separate piece of wire. All I can say to this is 'YUM, YUM'! 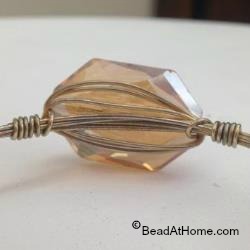 If wire wrapping is a direction for you and replicating this particular piece is on your radar, I have compiled a list of potential supplies and a wire sculpting course in the links below that may help you get started. Following these links will take you to a selection of Swarovski crystals and Wire for Wrapping found at Fire Mountain Gems that would be suitable for this piece. Choose just one color or a variety of colors in case you may want to make more than one bracelet and wear them in multiples. 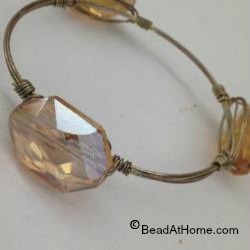 Wire wrapping instructions can be found in several locations on the internet but allow me to share a course that I found early in my days when I was just starting out. It was not a direction I was immediately interested in but added to my 'wish list' and held onto this resource. I was taken with Preston Reuther's story and have kept track of his growth over the years. It's stories like this that continue to give hope for Bead At Home. This link to Preston Reuther Master Wire Sculptor will take you to his main website where you can view his creations. You will see on the side navigation bar a tab for "Home Jewelry Business". You may consider giving them a look and see if this might be a good fit for you if wire wrapping interest you. If you should decide to follow through and re-create this gorgeous piece I hope you decide to come back and share your project with us and how you went about creating it. 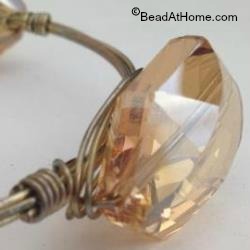 Here at Bead At Home we are always looking for stories to share with our audience to encourage them to move forward and learn new techniques with beading jewelry. The BeadStyle Magazine November Issue is out on the stands, have you grabbed your issue yet? If not, then allow me to provide you a convenient way to get yours right on-line. Following the link above will take you directly to Amazon.com. There you can pick up a subscription to this project packed beginner beading magazine. You'll never miss an issue with a full subscription. 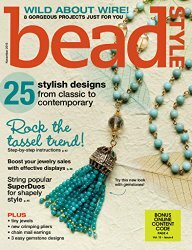 If you haven't heard me say it before...this is my 'go to' beading magazine I recommend for beginning beaders and beyond. There are always such inspiring and informational articles that I still enjoy each edition. Although I've been making jewelry for over 10 years it is still the magazine that I prefer. While continuing to find the new normal I’ve decided the season has come to find a proper crafting/working area for me...it's time to move off of the kitchen table and set up dedicated work space. It is very important for organization and efficiency to get the job done and it's okay to give permission for other task to sit that don’t have as much importance. That will be a November project. Here is a picture of what was intended to be work space but haven’t made much progress...pretty bad huh? 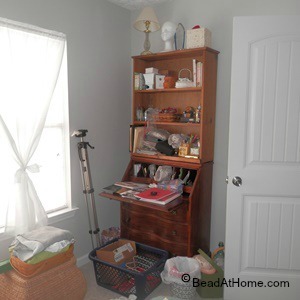 We discussed last month about beading organization being therapeutic...so I was wondering...Do you have your space set up? Did you get a chance to read the article I suggested about storage containers? If not then here is the link repeated if you would like to take another look or in case time didn’t allow. Just a quick reminder this link is available for a limited time. It will eventually be moved to a new location. In the meantime though, enjoy. I’ll be sure take lots of pictures and will share them with you next month. What else is in season for November? As I look to the calendar I see lots for November. Most of which is Thanksgiving in the United States and oh that well know busiest shopping day of the year...'Black Friday' quickly followed by 'Cyber Monday'. It's open shopping season for the Holidays. Great for Business! But for now to distract from that, November 16th is 'National Button Day'....OH GOODIE! Do you love buttons or is it just me? I don’t think so! Why else would a whole day be dedicated to commemorate ‘Buttons’. What is it about them that make them as much fun as beads? In honor of ‘Button Day’ we’ll be sending out a mid-month mini newsletter to commemorate this fun day with a featured project using buttons as clasp and other beading with buttons ideas. Now won't that be fun?!?! So be watching for that and we’ll share more with you then. If you would like to check out some other note-able 'goings on' that aren't quite as significant you can check them out here. See if you find one that catches your fancy. National Button Day did it for me...what about you? We are scheduling an interview series for 2016. 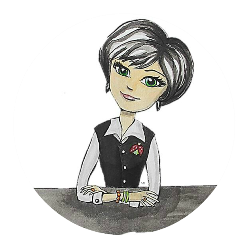 Every month for 2016 we will be sharing an interview of fellow beading buddies. Our Panel of Guest: We are compiling our list of beading buddies we have been following for the last 14 years. Our mentors and those we've met along the way, watching them grow and being utterly inspired by what they do. Do you have someone you would like to see interviewed? Do you have an inspiring story to share? I invite you to submit your name, let’s talk and get your story out to our audience. If you have some ideas that you would like to see happen with the E-Zine we are all ears. Just 'contact us' and let us hear your suggestions. As we get closer to completing a full year with the Bead At Home E-Zine the site surveys have continued to come in. Information that you have shared will be compiled and looked at for new information that will be added to the site. Thanks to you, we continue to grow and with growth more and more will be added to help you in your journey of learning how to bead. Keep talking to us, we're listening. We'll talk again in a few days with our mid-month mini newsletter talking about 'Buttons' so be watching for it. Disclaimer: Some of the links in this newsletter are affiliate links. If you click and purchase from these links we may make a small income from the purchase. This is how we are able to pay for our service to you at this time.